Push the spike in the soil until cap is just above the soil surface. After one year, discard the spike, as the fertilizer inside the spike no longer contains nutrients. Laguna floating plant baskets are ideal for ponds that don't have adequate plant shelves. The buoyant styrofoam float ensures that the basket stays at the surface, while the finely-woven fabric bags allow water in while also preventing soil from escaping. The floating baskets also provide additional shade and protection for fish. Laguna Planting Bags can be used for almost all pond plants. The bags are made of flexible material that allows you to place plants in confined areas such as narrow shelves or small nooks. Made of finely woven fabric, the planting bags allow excellent water permeability for plant growth, and they resist rotting. They are fully submersible and environmentally friendly. Allows water in and soil can't escape. Can be shaped to fit in small areas. Roots expand through the bag, making transplanting a snap. 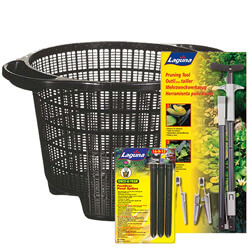 9½" x 9½" x 7¾"
11¾" x 11¾" x 9½"
Laguna™s Floating Plant Basket Kit contains 2 floating plant baskets, sized 25 cm (10 in) and 35 cm (13.75 in) in diameter. Laguna Floating Plant Baskets make planting and maintenance easy, especially for ponds that don't have adequate plant shelves. Made of finely-woven fabric, they provide excellent soil containment and protect plants from fish. The buoyant styrofoam float ensures that the baskets stay at the surface. The plant baskets also provide shade and protection for fish.